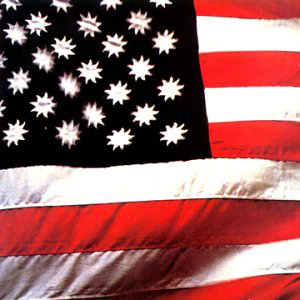 The seventies were here now, and Marvin Gaye had released his classic album questioning “What’s Goin’ On”. 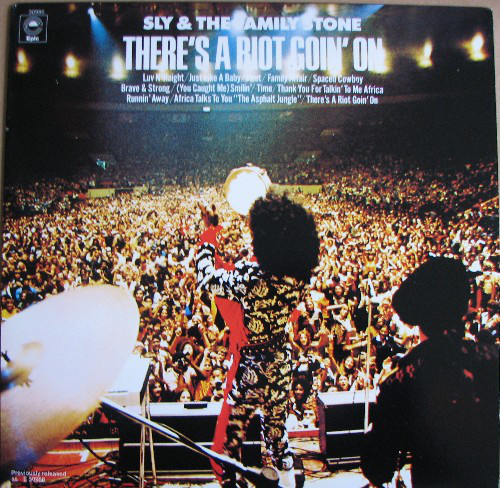 Sly Stone, by now drugged-up and sexually insatiable in a big way, told us that, even worse, there was a riot goin’ on. He tapped into the racial tensions of the age perfectly, even through the drugs’ fog. There certainly was some fog in the studio. Multiple recordings of the same track. Gone was the refreshing “play it straight” live feel of the earlier albums. An obsessive/compulsive Sly recorded and re-recorded songs until the tapes eroded. He also promised several sexual conquests a place singing backing vocals on the album, hence the many female voices piling up. Instead of the optimistic, rock-laced soul that had characterised the band’s 1960s output, “There's a Riot Goin' On” was urban blues, filled with dark instrumentation, filtered drum machine tracks, and plaintive vocals representing the hopelessness Sly and many other people were feeling in the early 1970s. The album is characterised by a significant amount of tape hiss – the result of Sly's afore-mentioned extensive re-recording and overdubbing during production. Only four short years had seen immense changes in the band’s work. Gone were the spectacular horn riffs, the individual band members taking vocal parts and the great, melodious bass lines. Now we had some of the heaviest, speaker-shaking funk bass they ever laid down in tracks like “Just Like A Baby", “Poet” and “Time”. Heavy clavinet now dominates. Not a horn within earshot. Jerry Martini was on his way out of the group, as was Greg Errico and Larry Graham, in the midst of a number of unsavoury incidents and claims and counter claims. All that joyous bonhomie of the band had evaporated. In the midst of all this, a remarkably catchy, soulful hit single appeared in “Family Affair”, whose perfection sits slightly at odds with the rest of the album’s extended funk outs and multi-layered madness. The opener, “Luv 'N' Haight” is relatively tuneful too, but still pretty heavy and layered. “Africa Talks To You “The Asphalt Jungle” is one such drawn-out semi-jam, but sort of appealing it is too, but a world away from all that horn-driven beauty of “Dance To The Music” and “Everyday People” and those wonderful first four albums, this was dense, intense and introspective. In a way, the joy had gone out of the band, sniffed up its collective nose. “Brave And Strong” continues in the same vein. Funky as hell, but a muddy mess, sound wise. “You Caught Me Smilin’” has a soulful groove, but again, the production spoils it, and while “Spaced Cowboy” is impossibly funky in places, the tape hiss is awful and the less said about Sly’s yodelling vocal the better! “Running Away” was, surprisingly, another acceptable, tuneful choice for a single, but “Thank You For Talkin’ To Me Africa” was another extended funker, a slower arrangement of the previous years’ single “Thank You Falettin’ Me Be Mice Elf Again”. The extras are all instrumentals and pretty inessential, to be honest. Nowhere near the standard of the instrumentals from the previous four albums’ extras. Overall, the album is a difficult listen. I much prefer the previous four abums, by far, whatever critics say. It is sort of fashionable to praise this as being Sly’s masterwork. Come off it.